The Missive Maven: A visiting bat - a real one! 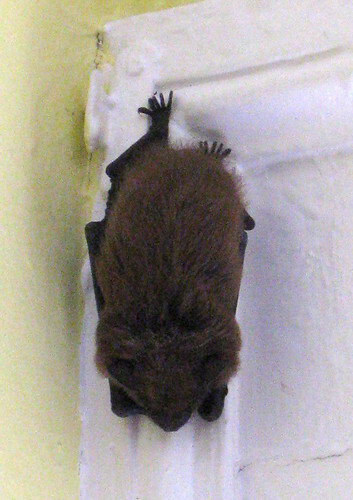 This morning I found a surprise in our spare bedroom - an actual, real live bat hanging in the corner of a window-frame. I had to do a double-take at this, because I actually have a lot of fake bats hanging around the house. (Really, I do. Y'all know how fond I am of bats.) 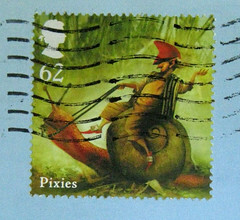 When it flicked its ear at me, I knew it was not a practical joke from my beloved husband, who occasionally moves my bats around. 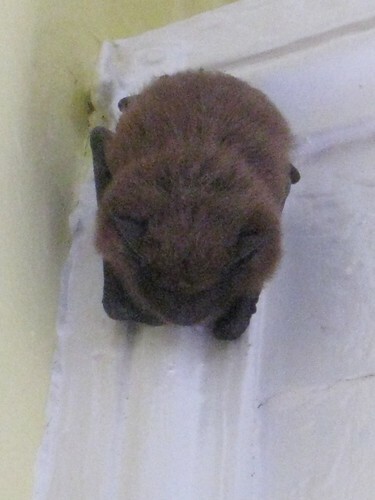 I felt really sorry for the bat (and still do - he or she is still up there), and immediately removed the sleeping cat from the room and shut the doors. We opened the window and the screen to let it get out, but it's still hanging out there. It was full daylight when I discovered it, and bats do not like to fly during the day, so said beloved and I agreed to keep the doors closed and window open all day, turn on the light at night and hope the bat leaves of its own accord. I KNOW this doesn't have anything to do with letter-writing, but you loyal readers know how much I love bats, and often post photos of drawings of them and various bat stationery, so I just had to share this odd story. 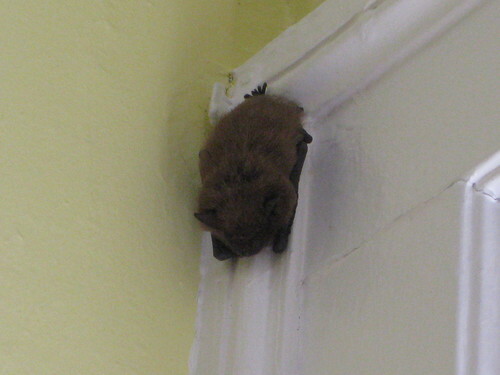 I have friends who complain all the time about having bats in their apartment (and they usually freak out and swat at them with brooms or -- *shudder* -- tennis rackets), and it's never happened to me, until today. Best guess is that it came through the fireplace in the room next door, and somehow flapped around into that spare bedroom and couldn't figure out how to get out. We haven't disturbed it so don't know if it's wounded, but it doesn't appear to be. Biggest fear is that it was bothered by our cats. Of course we worry about rabies, but it doesn't appear to be rabid and is so far exhibiting completely normal bat behavior - i.e. sleeping and remaining still during the day. I am rather excited to see what happens at dusk, though - I would really love to watch it fly out the window. Of course I took a million photos - most without flash because I didn't want to bother it. Here is the whole set of photos if you want to have a look. Oh my! He (she?) is so fuzzy! Cute little fella just hangin' out in your spare bedroom. I do hope that he finds his way home. I think I would have passed out I am so sorry but I am just not comfortable around spooky creatures and this to me qualifies to be that . I often think it has something to do with my grand when she told of the story of the boy who lives down the street from her being bitten in the head one night , and my uncle saying that "the boy was still not right ". i guess that is why I really dont like spooky creatures good luck on getting it out of your house . great blog and great pics and I hope it is okay and not sick or anything . He/she's so cute! It must have known how you feel about bats. Phonelady - there's nothing spooky about this cutie. I feel so bad for bats that they get such a bad rep... which is part of why I am a loyal, supporting member of Bat Conservation International. They are wonderful animals, and vital to a healthy ecosystem. Also, this kind eats bugs! Yay! And yeah, Julie - it picked a great apartment to stumble into! No tennis racket treatment here. Fake bats? Cool. Real bats? Not in the house, thank you very much. For all you know, it might morph into Bela Lugosi at sunset. When I was a student at Ohio State, I spent a couple of summers at Stone Lab, their field station on Lake Erie. Lots of bats there. Saved one by scooping it out of the toilet with a kitchen strainer; removed another from a room - hanging by a door like yours - with a cone from the water cooler. That made it really easy to toss it back into the air to fly away (at night, of course). Wonderful things, bats! I find bats fascinating too. If you ever get the chance, go to Carlsbad Caverns and see the bat flight out of the cave at dusk. It is tremendous!! Carlsbad Caverns (and Austin, TX to see the famous bridge where they roost) has long been on my list of things to see! Okay I am giddy with curiousity! How is the batty bat? Also do you own StellaLuna? I own StellaLuna the plush stuffy bat, but not the book! The batty bat situation did not turn out as well as I'd hoped, in that none of us escaped trauma. It did not fly out the open window, even two hours after dark, so my beloved convinced me we could easily get it out now that it should be awake. Fortunately, yesterday morning there was no sign of the bat. I did a ginger dismantling of the room - took off the comforter and sheets and washed them, removed all the boxes from under the bed, and confirmed that the room is now bat-free and it flew out the window on its own overnight. I was just going to ask if the victor the visiting bat was still hanging around lol. Sorry it caused so much trouble but glad it finally left on its own. Good thing you like Bats! Furry! I didn't expect it to be so furry. I haven't had much luck in attracting bats here, but it may just be that I'm not out late enough to see them. I suspect we must have bats because we don't have a huge mosquito problem and our area is quite damp. I am a member of the BCI for years, too! Going to the Bridge in Austin has long been a dream "pilgrimage" of mine. Thankfully there are plenty of bats right near my town so that i can enjoy and thank them for keeping the pests at a minimum regularly! Yay, Jess! Shout-out to another BCI member!